Featuring a 12mm diameter high tensile multi-strand steel cable and an anti pick 5 pin dimple key cylinder, the Kasp 730 series offers effective and reliable cable lock protection. The generous 1.8m length recoilable cable ensures that both wheels and frame can be secured to a solid object, whilst the mounting bracket with quick release mechanism allows the lock to be fixed to the bike frame or seat post for easy transportation. The reversible dimple key and self locking mechanism ensures ease of use even in low light conditions. 10 year guarantee. 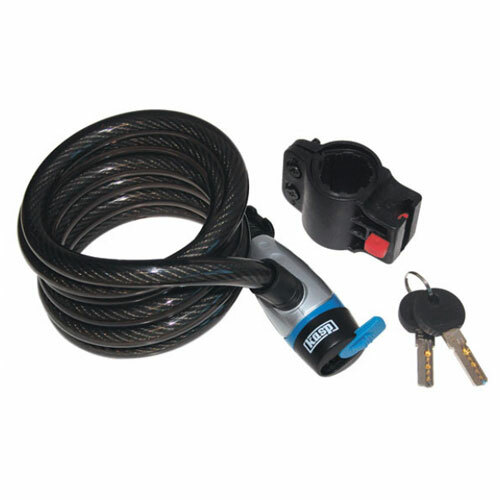 Reversible key & self locking mechanism - For ease of use even in the dark.